Holiday Cheer Giveaway Fail! I was so busy yesterday I just realized that Day 9 of the Giveaway didn't publish! Let me get back to that one and I'll try it again after I get Day 10 up so I don't get myself too confused. Winner Announcement for Days 7 and 8: The winner (via Random.org) of Day 7 is JenD! The Question of the Day was Do you enjoy the wrapping phase of the whole gift-giving experience? Jen responded I am not crazy about the wrapping, i am TERRIBLE at it! She will receive the Nicole by OPI Merry Minis set. The winner of Day 8 is Rachel. She answered the Question of the Day, which was Tell us a favorite or an eventful Christmas/Holiday memory--something that stands out from other years past, with When I was six years old, I really, really wanted a Felicity doll (American Girl dolls). I prayed and prayed for one. My parents couldn't afford it, but an aunt randomly decided to buy us a gift that year. Christmas morning, God answered my prayers and she was under the tree! Her prize will be the the celebrity fragrance gift sets from Coty. Day 10 of our 12 Days of Holiday Cheer Giveaway features something that I just love, and the minute I saw it, I knew I had to have one. I actually picked up both of the colors they had available, Classic, and a purple-themed one called Sulty. I thought it would make a great prize, so I picked up a third one for the giveaway! This is the Lancome Festive Soirée Gift, which is currently available at my Lancome counter. I saw it in the Carson's sale paper this week, but I don't see it on their site, nor do I see it available anywhere else. I'm not sure if it's exclusive to Carson's, but it's $34.50 with any Lancome purchase. 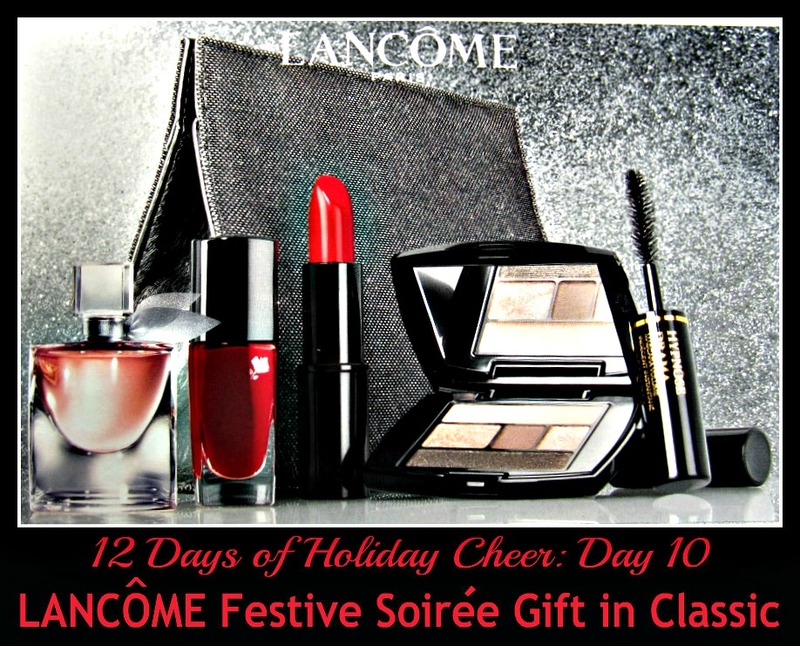 I've recently rediscovered Lancome, and I'm loving some of their skin care and color cosmetics, so I had no problem deciding on some items to meet their "with any Lancome purchase" criteria! Here's a reminder of the rules: Just answer the day's question (below) and leave your eMail in the comments (or check back to see if you've won if you don't feel comfortable leaving your address. You can then eMail me at mej0620@hotmail.com). U.S. residents only, Followers only (includes Google Friend Connect, subscribers, social media followers). The photo above is the cover of the box, but I wanted to take another photo of the actual products, mainly to show you the bag. My photo below comes nowhere near capturing how pretty it is. I've been looking for a small sparkly bag for a couple of Holiday parties I have coming up, so this is perfect. It's a dark charcoal grey that boasts some major sparkle! It looks black or grey, depending on the light. There's a lot of room in it for a little clutch, so I love the bag as much as the products. The products in the Classic color selection include a mini bottle of their new La vie est belle Eau de Parfum (0.14 fl. oz), which I love the smell of, Vernis in Love nail lacquer in Madame Tulipe (0.21 fl. oz. 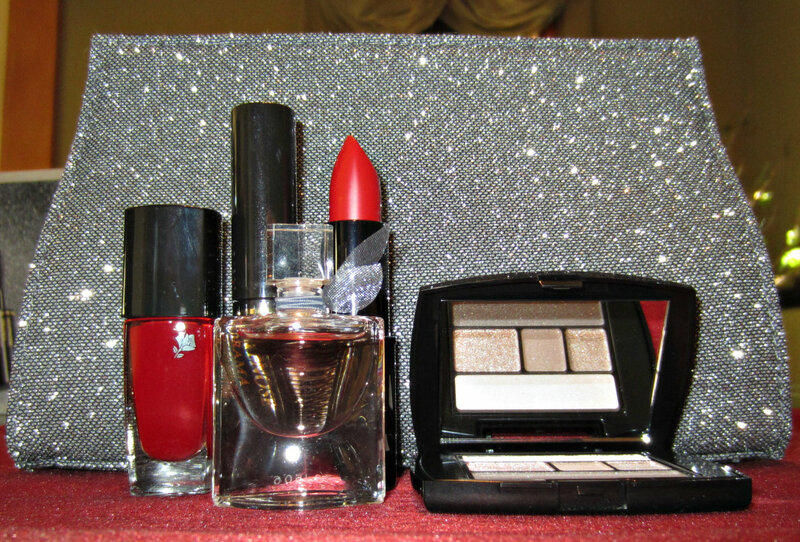 ), Color Design Sensational Effects Lipcolor in Red Stiletto (full sized), Color Design 5 Shadow & Liner Palette in Taupe Craze (these are smaller than their standard Color Design palettes), and Hypnose Drama Mascara in Excessive Black (0.135 fl. oz.). 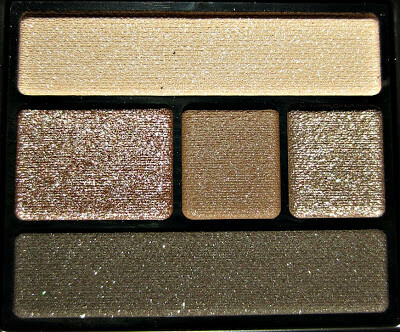 Here's a closer look at the Color Design 5 Shadow & Liner Palette...sparkly taupes, golds and browns. 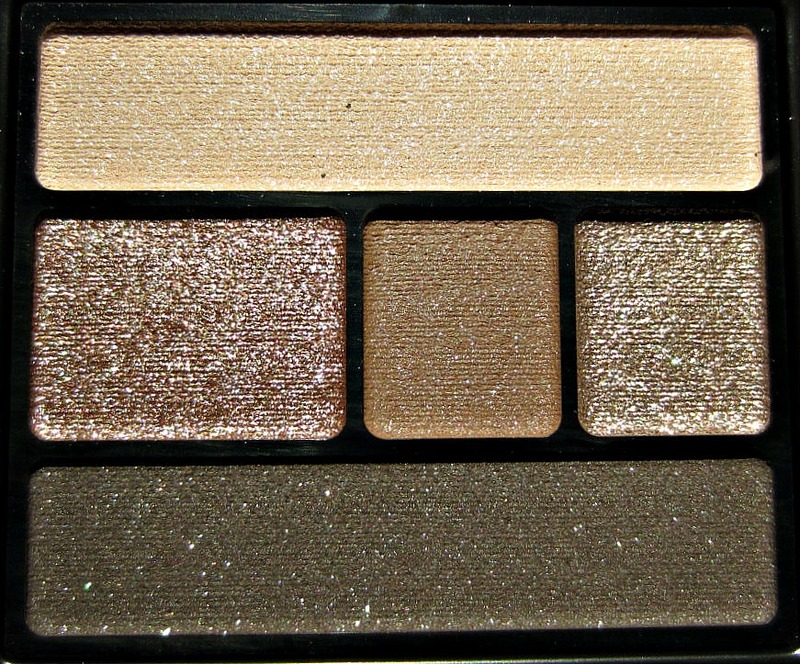 My collection of these in the full-sized version is growing because they keep introducing such pretty shades, and I like how nicely they apply and wear. I haven't swatched the lip stick yet, but it looks very glamorous and vibrant--a blue-based red, my favorite! The nail color is described as a dark bordeaux red, and it looks like it could have a jelly finish. 12 Days of Holiday Cheer Question Day 10: Holiday parties...love 'em, or not so much? My Answer: Well, I would say I mostly enjoy them. There's one we go to every year that is always a class act and very enjoyable. It's always at a different restaurant, and the host goes all out with every aspect of it. It's work-related for my husband, but it's a very fun group of people. There are some other parties that usually make for good stories later and embarassing pictures show up on social media sites to confirm those stories...none of myself that I've ever seen though! Let's just say we've gotten more selective about which ones we attend. So yes, some parties are fun and I look forward to them, while some of the other gatherings I could probably skip and not feel like I missed too much. If it's a party with friends, I love 'em. They're a great excuse to wear bright and shiny clothes and holiday novelty jewelry that might err on the side of tacky at other times of the year - but is perfect during the holidays. Work holiday parties....not so much. They're always awkward faux-social occasions. I'm pretty introverted, so I have to force myself to go to holiday parties, especially if the host is an acquaintance more than a friend. But usually I'm glad I went! It depends on the type of holiday party and who will be there. I don't like parties much at all, but small get togethers with friends or family are nice. For the most part I love holiday parties. Sometimes I can live without work and family parties, but holiday celebrations with friends are always a great time. Can't say much about them- we spend holidays with family and have never been to a holiday party. I'm not a big fan of holiday parties. I prefer to be with family. I stay away from holiday parties, unless I really have to go. I prefer to stay home. I am not a fan of holiday parties. Oh, thanks for the giveaway! I love holiday parties...when I know everyone. I'm not at all good at socializing in large groups of people I don't know! Can't say I often go to holiday parties but I don't think I'd mind going to one too much. Could be fun! A lot depends on the crowd that's going to be there. If it's loaded with people I don't know then my shy side comes out and I don't enjoy them. But if I'll know a good portion of the people then it's fun. I love parties. The holidays are a great excuse to eat, drink, socialize, and have fun! I love holiday parties if they involve friends. I don't care for the usual office holiday parties though. They're okay but it matters who is there and who I'm with :) Thanks for the giveaway! I usually love the holiday parties I have with my friends, but I'm not a big friend of those family holiday parties with tons of relatives that I hardly know. It's okay, but not my favorite! Anyways, great giveaway!! As a rule, I really enjoy going to parties. It is usually a time to link up with friends you might otherwise not see very often. I love to dress up and do the make-up and hair thing. Of course I always have a perfume I like to wear. Another thing that is fun is trying out all the different foods. I love to go to theme parties or Pot-luck dinners. It is so fun to try new recipes to bring. I enjoy the parties. I enjoy eating cookies and sweets and white elephant gift exchanges where you get to steal gifts! With family and friends, I enjoy holiday parties. I'm painfully shy, so if it's a party with a large group of people I mostly don't know, I'm often filled with dread and anxiety at the thought! It depends upon the party. I love holiday parties with my extended family, but office parties not so much. I like them and usually go. Unfortunatly I have to miss mine this year due to travel. not really, unless with close family. I usually don't like them, I do however love the food. I'm not much for parties. I'd rather have tiny intimate gatherings with a few friends or close family. I always go to holiday parties, but I don't always love them. I love the getting dressed up all festive like, and seeing friends, but I have never been able to eat at holiday parties because of food allergies, and its never fun to be hit on by the friend's uncle who's had a bit too much eggnog. I honestly dont care for parties that much, I feel obligated to go every year and I'd rather do something different every year!